Sometimes growing up is seeing someone else's side of the story. Four stories. One truth. Whom do you believe? Callum has a family secret. Yasmine wants to know it. Juliette thinks nobody knows hers. All Ruby wants is to reinvent herself. 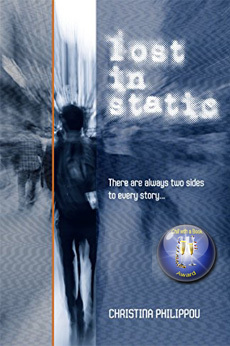 Lost in Static is the gripping debut from author Christina Philippou. Whom will you trust? 1. Were the characters strong and engaging? 2. Was the book well written? 3. Did the plot have you turning the page to find out what happened next? 4. Was the ending satisfying? 5. Have you told your friends about it?